Solve the mystery of the long lost treasure. 100 years ago today, thieves broke in and stole the family gold. They were caught but the loot was never found. An apparition has been reported in certain places – each sighting has given us a clue. X marks the spot me hearties for a treasure map adventure like you’ve never seen before. Also refer to our Pirate Dictionary for more. Only you can find the lost statuette by venturing where others fear to tread. Ancient runes point the way to treasure from a lost civilisation. Spot the hidden Easter Bunny and solve the riddles to find the final answer. See also Easter Egg Hunts. If you can establish the final resting place of the missing knight, you will solve a riddle that has puzzled generations. Using ancient architecture and hidden clues work out what actually happened to the last of the missing people. We have a mission for your eyes only. To accept this mission, open the envelope in front of you and follow the instructions carefully. See also Codebreaker 4×4. The concert is about to start but we’ve lost the words. Use the clues to find the location of each line before the fans lose their cool! You may not realise what you have been looking at. For over a century the spot where you are standing has represented something significant. Every place has hidden gems which, until pointed out to you, will remain shadows in the corner of your eye. Only by exploring all the features of our property including the gym, pool, grounds and dining facilities can you discover the secret password to use at the bar. Using accurate maps, compasses and setting up way points with a puzzle in each location to reveal the next point you can combine the two disciplines. Take a look at our range of Treasure Hunt Props. Take a look at some of our examples. 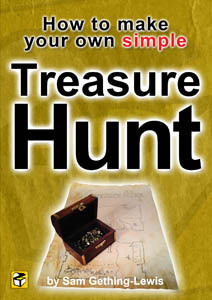 Look at these Treasure Hunt books for more inspiration or buy these Treasure Hunt Movies for some great ideas..